In many ways, Barack Obama’s approach to Iraq is strikingly similar to that of the Bush administration and John McCain. In theory, the addition of Joe Biden to Obama’s ticket could change this, but over the last weeks and months there have been interesting moves by Biden to remove most traces of his “Iraq plans” from the public domain… Full story here. Yesterday’s failure of the Iraqi parliament to pass the provincial elections law before the summer recess may well end up being blamed on Sadrists and other “recalcitrants” who refused to give up their principles and adopt a more “businesslike” attitude. Or, alternatively, as an AP headline puts it today, “Iraqi election bill falls to ethnic rivalry”. 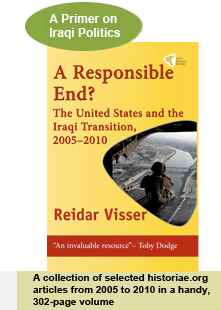 However, quite apart from issues related to Islamic radicalism or ethnic identities, first and foremost the parliamentary deliberations of the elections law exposed some of the fundamental weaknesses and contradictions of Pax Americana in Iraq… Full story here.